I had to special order these from George back in 2007. I wanted this special neck. Mostly so that it would not get damaged. They are 23 inches long, 9 inches wide and 9 inches tall. As you can in the pictures this decoy have amazing detail. 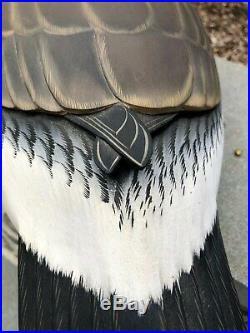 This goose has crossed wing which has a better paint job than the regular decoys. The cross wings are even raised. George has been in may publications and is known to be one of the best decoy carvers in the US. He also was featured in the book Decoys "60 greatest living decoy carvers". These are both stamped and signed by George and from 2007. 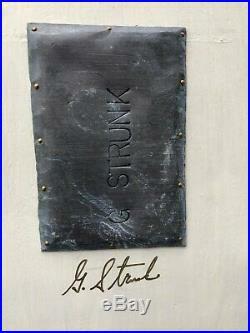 I have about 9 pair of Strunk decoys. Please check out my other auctions for other decoys. If you need any more pictures or different angles please let me know. The item "GEORGE STRUNK CANADIAN GOOSE DECOY NEW JERSEY CROSS WING VERY RARE 2007" is in sale since Thursday, February 7, 2019. This item is in the category "Sporting Goods\Hunting\Vintage Hunting\Duck Decoys". The seller is "texastom32" and is located in Severna Park, Maryland. This item can be shipped to United States.